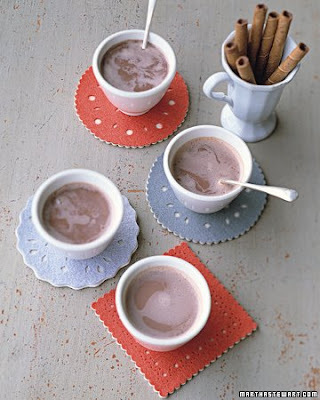 For lovers of hot cocoa, coffee or tea, this felt coaster project found on MarthaStewart.com would be the perfect inexpensive gift to give. Stay warm! I hope everyone had a wonderful Thanksgiving with family and friends! Unfortunately, I had a babysitting emergency to help a friend out so I was unable to complete my assignment for my blog. It's always nice to return a favor for somebody though! In addition, my camera was not cooperating very well. Or it was operator error...not really sure. So I couldn't get many photos. Ugh! Have a wonderful weekend and remember to keep on junking! We are having my parents over for Thanksgiving this year so it gave me the opportunity to make a beautiful tablescape. I challenged myself to create a budget-friendly setting using only thrift store and flea market finds. I think I found so many great things and look forward to putting it all together. Have you set a goal or challenge for yourself this Thanksgiving? I'd love to hear about it. Please come back to see Rustic Elegance in my dining room. Shaker Heights is a beautiful old suburb of Cleveland and only about 25 minutes away from my home. 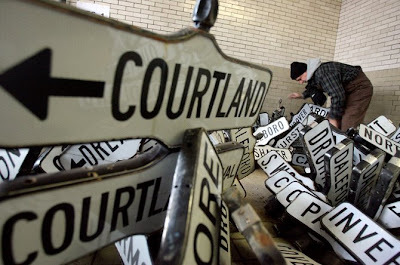 I was saddened to read this morning in the Sunday paper that I missed out on their wonderful sale of old street signs. Beautiful black and white enamel signs that go with just about any decor today. Most were at least 50 years old and only $30 each. 440 signs were sold. My junk radar just didn't cut it this time. I realize now that my husband and I don't have many pictures taken together or even alone for that matter. So this will have to do. C.T. 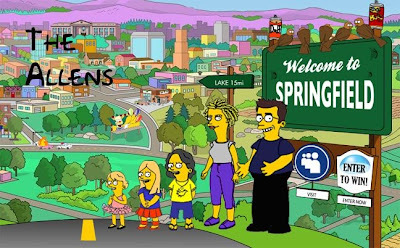 is a HUGE fan of the Simpsons so this is very appropriate. ...and here's our whole family. 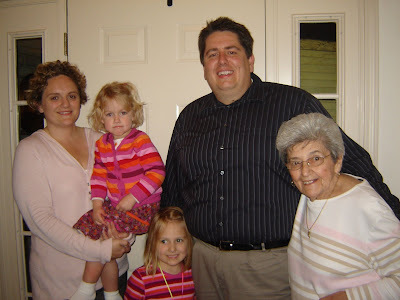 Actually we have one recent picture of us (minus my oldest daughter unfortunately and we added Great-Aunt Sylvia). Wishing my husband of 6 years a very Happy Anniversary! Until this year I've never set up our Christmas tree quite so early. Coincidentally it has not stopped snowing around here since I did. My husband claims it is all my doing. That can't be possible...can it? Quoting Al Roker, how's the weather "in your neck-a-the woods?" For me, it's easier to decorate one little area of my home at one time for the holidays, and then move on to the next...time permitting of course. I discovered this after having children. If I attempt to tackle an entire room it just doesn't work. Ending up with rooms only half completed and incorporating the green and red storage tubs as part of my holiday decor, is just not the look I go for. So what I will do with my blog is record my completed holiday decor...as it occurs. It may take me until 3 days before Christmas to finish everything, but you'll see it all. I like to wait a few more weeks before I snag some greenery from the outdoors and purchase my berries. Those two things always make this collection look so pretty! So stay tuned. The shelving unit was retrieved from the trash of a former neighbor of mine. Free. Each of the white pottery pieces cost between $.50 to $3 each. The crystalized branches were given to me by my mother. She received them (and more) from a family friend that works in a gorgeous landscaping nursery. Free. Vintage silver balls - Purchased 3 large boxes at a thrift store. $1/ box. Come back for more of my holiday decor. I think this will keep me on track too so please leave your comments! I love them so!! 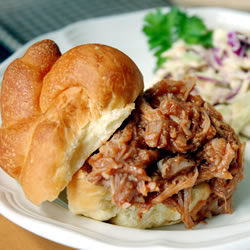 Photo courtesy of cookin'mama from Allrecipes. We don't do professional photos very often due to the cost. This is my solution. We baked wonderfully good sugar rolled cookies and made an easy peasy icing. The girls had a blast decorating them. We also made popcorn balls! Yummmm. I was a Crock Pot Extraordinaire! My husband was quite pleased with both dishes. Saturday - Barbeque pulled pork sandwiches with salad and chips (you can't have bbq pork w/o chips!) Try this recipe. It's so easy...so good! Check out the top of my post for the glorious pic. *****Instead of me emptying the entire jar of sauce onto the pork prior to placing in oven, I recommend mixing in about 1/3 to 1/2 of the bottle. That way your guests can adjust the amount of sauce to their taste. Photo courtesy of Courtney at Allrecipes. Both recipes found on Allrecipes.com. The biggest change I made was placing the frozen chicken breasts in the slow cooker whole instead of cubed. I then shredded the chicken once cooked and mixed it in with the soup and cream cheese. Very good and easy! Also add on the cleaning, the full-fledged grocery store trip and the general day-to-day stuff and you get one tired woman! Sorry no junking stories today...no time for that. The library - free home decor?